Wally is a funny dog with a playful personality. He's not beyond trying to start something by slapping his paws on the ground with a few small barks. Then he'll dart around and do it again, trying to entice someone to play. And if you do, get ready because it's game on now! He also loves soft, fuzzy things. He'll grab and pounce on them...or lay on them if they are big enough. He LOVES his crate, and loves training and he's a quick learner and a joy to train - always gives me his best. He has some small jobs around the house like opening doors and barking at the kitchen timer or tea kettle when they go off. He is adorable. It is always so cute to watch them play. They are clowns. Cute pictures. wally must be a real joy to be around and really smart. they are experts at getting noticed and sooo lovable. thanks for the pics, they are so cute!! 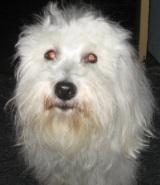 I think smart and quirky is a good description of the Coton de Tulear. They are also funny, happy, cuddly, friendly, loyal, mischievious, lovable, protective, and provide so much joy. Wally sounds like he's got a big personality to along with his good looks. Thanks for sharing!